Nelson compared the Coconut Chair to a coconut cut up into eight sections. The Coconut Chair, however, reverses the colours: The outer plastic seat shell is white and the one-piece upholstery is available in different colours. The inviting and comfortable armchair gives users the freedom to sit in countless different positions. Shell: white, fibreglass-reinforced plastic. 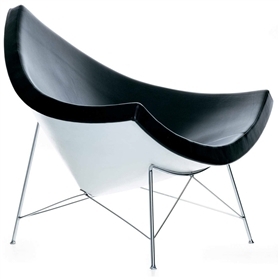 - Upholstery: single-piece upholstery, with leather cover. Base: polished chrome tubular steel base. Glides: all bases are fitted with glides for carpets. Glides with felt pads for hard floor surfaces are available upon request.